Upscale, professionally decorated beach home with 8 bedrooms and 9 bathrooms, private heated pool, outdoor jacuzzi, two living areas, second full-size kitchen. 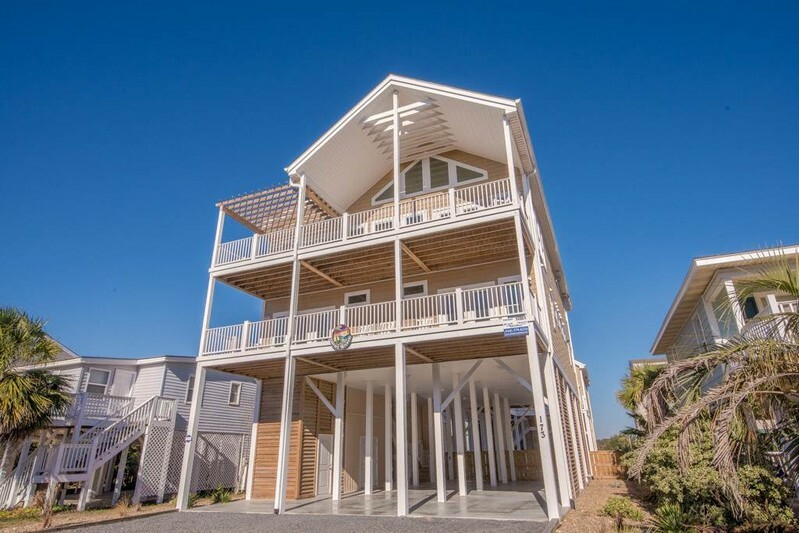 Located across the street from the beach with lots of porches and space for everyone; it is perfect for large gatherings. Please note that an event fee will be charged for any functions held at this location; inquire for details. Pool heat for $100.00 daily (must heat entire length of stay). There is an outdoor hot & cold shower. Large decks with rockers and Adirondack chairs overlook the ocean, the Intracoastal Waterway, and the pool/jacuzzi area. This reverse floor plan home has an extra large kitchen, living and dining room space with vaulted ceilings. The kitchen has a Viking 6 burner gas range with built-in grill. There are also stainless appliances including two full-size double-door refrigerators, a double oven, and two dishwashers. Wet bar area with stand-alone ice maker, wine refrigerator and small beverage fridge make entertaining easy. Other amenities include two new large-screen Roku TVs, wireless internet access, ceiling fans throughout, hardwood and tile floors throughout, gas grill. Plus, three separate full-size washers and dryers. On the first floor, there are three master suites each with king beds, access to porches, and an ensuite whirlpool tub and separate walk-in shower for each. A kids room has two sets of bunk beds with trundles to accommodate up to 6. There is a second full living area with a large television, small wet bar, and queen sleeper sofa (Tempur-Pedic foam mattresses on all sleeper sofas). Two Murphy bed systems (each with two full sets of bunk beds) across from each other are located in a breezeway nook that links the main house to the back cottage. Along the wall between the Murphy bed systems is a queen sleeper sofa. Further down the enclosed breezeway there is a separate cottage with a full size kitchen, two bedrooms with a queen size bed in one and, a sleeper sofa in the other, and two full bathrooms. Main living, dining and kitchen area are on the second level. There are two bedrooms on this level, both with queen beds and ensuite bathrooms. One bedroom is ADA compliant with a bathroom accessible for mobility devices, no-edge shower, and custom vanity. There is a third full bathroom on this level. Sleeps 34. K, K, K, Q, Q (ADA), BB/BB with 2 trundles (6 twins), FSS (kids nook), QSS (main living room), QSS (second living room), BB/BB (4 twins) with QSS (library), QSS (cottage), Q (cottage), QSS (cottage). All bed and bath linens provided with your stay. Bath towel sets for 34. Two pack-n-plays and a high chair are provided as well. Rent for less than a week with a 3 night minimum from Jan 1 - May 18 and Sep 22 - Dec 31. Weekly rentals only at other dates. Please, no smoking and no pets. YOU CAN'T BEAT THIS PROPERTY. I HAD THE PLEASURE OF VACATIONING HERE OVER THE 4TH OF JULY HOLIDAY, 2018. THE PROPERTY IS UNMATCHED. WE MADE AN ERROR AND DIDN'T RESERVE IN TIME TO HOLD IT FOR 2019 AND ARE VERY VERY DISAPPOINTED. I WOULD STRONGLY RECOMMEND THIS PROPERTY TO A LARGE FAMILY THAT LIKES TO HAVE A LOT OF GREAT TIMES TOGETHER! This property is UNREAL and beautiful! Ocean Isle is low key and amazing. This house is like staying at the Ritz, it doesnt get any better! Loved everything!! !